OK. Did you know there are a plethora of technologies out there that can increase your effectiveness, performance, situational understanding, minimize risk, manage resources, improve command and control, and improve accountability? Did you know that many of these solutions are affordable? Did you know that in most cases, these technological advancements pass the common sense test where cost benefit analysis is concerned? Hopefully by the end of this article, I’ll have helped you think outside the box and see how these and many other currently available technologies can make a difference in your departments, neighborhoods, and benefit your families and yourselves. The role of Incident Command is to assess the situation, manage the incident, ensure safety, establish command, control and communications, and request resources. By breaking incident command into its basic elements, we can better understand how to accomplish this role effectively, efficiently and safely. d. Ensure the safety of both responders and the public and minimize damage to property, including hazard identification and mitigation. The role of the Tactical Operations Center (TOC), Crisis Action Center (CAC) or Emergency Operations Center (EOC) is to support the Incident Commander and the municipality by managing every aspect of emergency support minus the incident itself. A look at the basic elements here is useful in gaining a better understanding as well. Now that we have broken these down to their basic elements we can begin to look at ways to accomplish each of them more effectively. Obsolete technology, budgetary restraints and Jurisdictional information silos can cause communication breakdowns and poor situational management for law enforcement, Fire services and others in public safety. Collaboration, not just communication is key and there are many ways to accomplish it. Near real-time integrated voice, video and data collaborative applications are used every day in every aspect of our daily twentieth century life such as texting, instant messaging, point to point, video chat and video conferencing apps. Video conferencing apps, such as ‘ooVoo’ or ‘Hangouts’ allow you to video chat with up to 10-12 friends or ‘Viber’ which allows up to 40 friends. Replace the word with fellow responder and then we are on to something. These apps are becoming essential in twentieth century command and control as well. Network digital audio/video communication and surveillance provides near-real-time information for timely accurate decision making, sharing plans, resources and updates instantly and some even provide AV analytics that can be used for education and training during after-action reviews. Imagine getting live video feed from ‘inside the fire’ or using a small unmanned aircraft (drone as they are commonly known) mounted thermal viewer capable of sharing plans, resources and updates instantly. 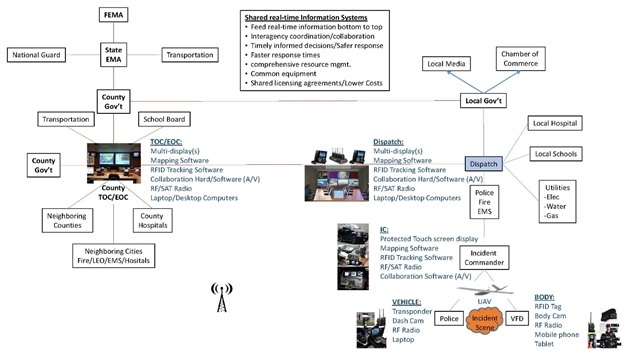 The uses are endless and enable better planning, training, situational awareness and response capabilities to emergency situations, and can also improve agency-specific day-to-day standard operating procedures. By Daily Globe News on Nov 25, 2010 at 9:57 p.m. In part two we look at some examples of high-tech solutions that our team came back with from INFOCOMM 2015 that can assist in keeping your incident command or TOC in reaching maximum effectiveness and efficiency. We have matched these to the key elements of incident command.